I hope everyone had a good weekend. It was hot here in Minnesota the past few days! Yesterday we had a heat warning out across the state. I don’t know about you guys, but if you have ever been to Minnesota in the summer the humidity can be a beyotch. It was over 100 with the humidity today. I literally walked out of my house and my glasses fogged up. I can honestly say that has never happened to me in the summer. The winter yes, summer no. Needless to say that a lot of time was spend indoors binge watching some of our shows. And what better way to binge watch other than popcorn! I am a big movie theater popcorn kind of gal. The more butter the better. My mom used to always make marshmallow popcorn when I was growing up. Somehow that came through my head this weekend and I just was craving it. But knowing me I can’t leave well enough alone so I had to doctor it up a bit to satisfy my need to rebel. I had some extra candy bars left over from when we went camping and figured why not throw them in the mix, add some drizzled chocolate and peanut butter flavoring and have a good old time! This was really addicting. Marshmallow popcorn alone is really addicting, but if it has chocolate and peanut butter then my name is written all over it. Place popcorn in large bowl. In microwave safe bowl, heat together your butter and peanut butter chips until melted. Add marshmallows and microwave for 1 1/2 minutes or until marshmallows start to puff up. Remove from microwave and stir until all melted together. Pour mixture over popcorn and stir to coat. Dump popcorn out onto baking sheet. 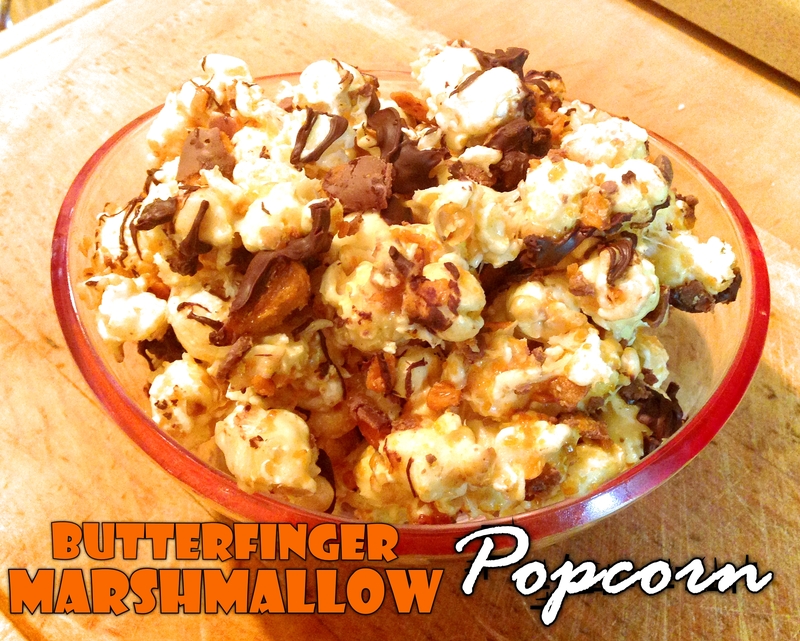 Crush your Butterfingers and sprinkle over popcorn. In small bowl, heat your chocolate chips in microwave in 30 second intervals until melted, drizzle over popcorn. Let set up for about 10 minutes, return to bowl and enjoy!